With winter just around the corner, the ducks, grebes and loons will begin heading to their wintering grounds. Common Loons, which are usually heard, if not always seen, further north when people go camping or visit the cottage, are currently being spotted down by Lake Ontario. In October at the hawk watch we saw a dozen of them flying over the bluffs heading from northern Ontario to the United States. The loon is perhaps best known for its haunting call, of which they actually have four distinct types: The tremolo, wail, yodel and hoot. The tremolo is used for greeting, the wail is heard mostly at night to locate family members, the yodel is only done by a male to identify his territory and the hoot is a location check for where the family is and to see if they are they okay. Every time I hear that distinct call of the loon it reminds me how very unique these water birds are. Loons will have one or two nestlings. 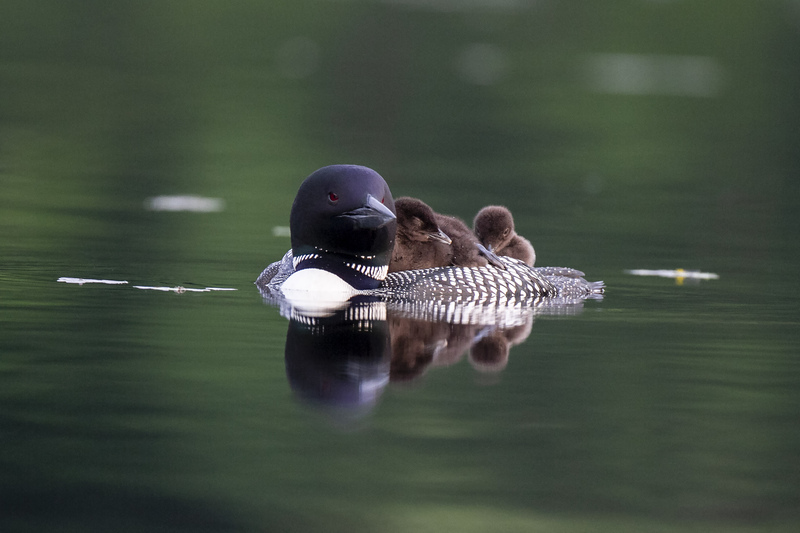 While loons themselves have few predators, the chicks are vulnerable to a wide assortment of predators including raptors, weasels, and mink. While the babies often ride on the back of a parent in the water to give them a break from swimming, it also serves to protect them from large fish and snapping turtles. At 11 to 12 weeks old the parents leave the young loons in their home lake. Talk about tough love, as this means they must fend for themselves for only a few months before winter ice forces them to migrate on their own. Migration, while a normal and natural part of life for loons, is actually very dangerous and often tragic. Over the past few years I have seen and heard of loons being found trapped in small creeks, small ponds, on fields, and in parking lots. When telling these stories, I’m often asked why, when they don’t appear to be injured, the birds can’t just continue their migration. Loons, like many other water foul, have a peculiar shape with their legs far to their back. This makes them excellent swimmers, but makes it very difficult for them to walk around on land. If you’ve ever seen them begin to fly, they look very awkward and comical as they have to run on the water, flapping frantically, before they are able to get air born. Their awkward shape means they need a long runway, sometimes up to a hundred meters, to take off. If you watch for it, y ou’ll find they usually run into the wind to help them get better lift. When a loon finds itself in a small body of water/river, or even worse on an uneven field, it becomes next to impossible for the bird to take to the air. 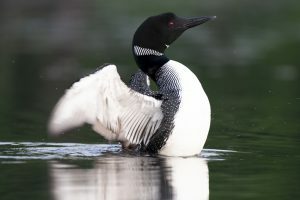 As the loon is also unlikely to find suitable food in these places, the bird’s health and chances for survival rapidly decline. Without help these loons will not survive. In the past few years I have watched and helped with the rescue of a few loons. One was just up in Markham where a loon had landed in tiny creek with less than a foot of water, lots of rocks, and thus no place for him to take off. It took two trained rescue staff in the water, and three volunteers watching and directing, to catch the loon and get him safely out of the creek. He was rushed to Toronto Wildlife Centre and checked over. He was luckily determined to have been in good health and was then taken to Lake Ontario to be released. My favourite part was the loon calling out as he ran across the lake before taking off.